After going all around Indonesia for some times, again, we back here again in Bali. In fact, there’s sill many areas that haven’t been discovered by us. We’re not going back to the area like things to do in Denpasar. We want to go deeper this time. In the district of Karangsem Bali, there’s one subdistrict in here. Thaht sub district has a name of Manggis. In this Manggis, there are many things waiting for us to go for them. Starting at the port bay to u the hills. 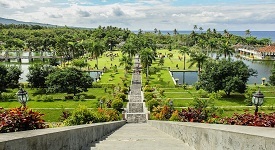 We here are going to tell you about 11 of them inside our list of things to do in Manggis Bali. The attractions are so great and very natural, just like the things to do in Bangli. So, Manggis will always be perfect for you. First thing first to do inside the area of Manggis is of course visiting the beach of Bias Tugel. Even though this beach is not very famous like things to do in Sanur, but in here, you’ll get this feeling of excitement but also calm. A calm excitement. Even thought there’s not single supporting facilities, the beach still looks very good. That’s the point, that’s what this beach want to sell to us, it’s pure natural beauty. 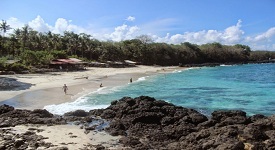 The beach is also complete with its corals and rocks up on it, making it much better than the other beaches out there. The next one is the Blue Lagoon beach. Located next to the first one for about a hundred meter only. Just like the beach above,this beach is also having its very own speciality. The sea condition in here is the best of the best, even more better than those beaches in things to do near Nirwana. The environment in here is very good for tanning, especially they serves us with a lot of benefits, including those tanning benches. Usually people just lay down in there for a bout an hour or two, enjoying the sea breeze and the sound of the waves. It’s really suitable to release much stress level. In the third place in things to do in Manggis Bali, we have this one of the best places in Manggis with the name of Putung Hill. This hill is actually located a bit higher than the other hills around. By that location, it makes this location having a bit colder weather than the others. But still, even though it’s cold,the environment around will spoil your eyes. You can take a look at the green jungles, vegetations, and the mountains. You can see them all while having a good meal served by nearby restaurant. Isn’t that sounds good? And then after calming a bit in those three locations above, now it’s time to take your adrenaline a bit higher by joining the Bali Extreme Adventure that located in the Yehpoh Street, Manggis, Karangsem. It’s better to o here with your friends, but if you happen to not having anyone with you, don’t be worry. There’s some people here or some tourists that will gladly know you. Basically the trip in this Bali Extreme Adventure is very simple. 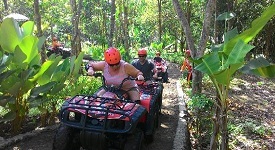 So you will ride a four wheels bike, or you can call it as a ATV, to go through some paths still in the area of Manggis. But, you will be taken into a very exotic places by your guide. It’s great. After doing an exciting ride with Bali Extreme Adventure, now it’s time to rest again in this very beautiful lake of Manggis called Yeh Malet Lake. 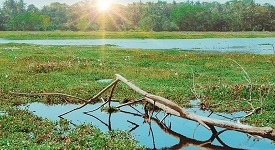 You can find this lake inside the area of Anitga Kelod, still around Manggis. You’ll not easily miss it. This lake is not so clear like the other lakes in Bali, but the existence of vegetations on the lake is actually a plus point. There’s not a single trash to be found, the people will clean it right away. So, if you want to take a look at it and pay a visit, please don’t make this lake worse than before. Maintain it well. Finally, the sixth place on our list of things to do in Manggis, there’s the Ujung Water Palace, the great location in Manggis. This park is very good for doing your activities with your family alone,with friends, or with your community. The place is so clean, it’s beautiful. This park is located on Tumbu area. In fact, some of the television cinemas and even some Indonesian movies took this place as a background. Yes, the combination of the green park and also the watery environment around it is the bomb. Better pay a visit in here, you must. Hose are the six places you should go when you’re in Manggis, but wait, there’s more! 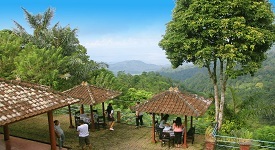 Asah Bug Bug Hill, the best spot to enjoying the magnificent view around. Those are the things to do in Manggis Bali Indonesia that you should know. They are very exciting and pleasurable for your journey in here. It’s time to explore some more, and not just stuck in the famous areas of Bali, like things to do in Gianyar. You must go to somewhere else, if you want to experience whole journey in the island of Bali. It’s okay to take the journey alone, all by yourself. But, it’ll be much better if you have some company on you, to have a lot of fun together and create those beautiful memories for life. And then, here’s our goodbye, see you later!